In your financial life you have probably aligned yourself with several micro-managers to assist you with various financial decisions. Oftentimes, these micro-managers provide advice or products specific to their area of expertise without the benefit of knowing your whole financial picture. That leaves you to coordinate all the micro decisions into your macro plan. Decisions you may not have the time or expertise to make and evaluate on your own. 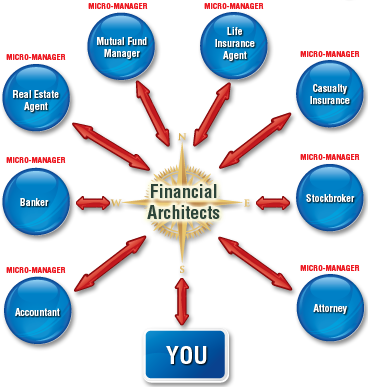 Financial Architects walks along side you as your Macro-manager to coordinate and evaluate the decision making process.